A lost ring we found in 2015 in Milton. 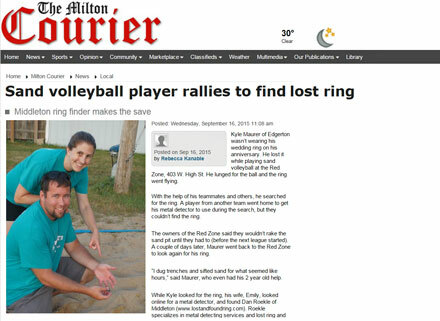 Rebecca Kanable, reporter for the paper agreed to run a story in The Milton Courier describing how Kyle lost his ring, how he found us and the long drive we too to find his ring with a metal detector. Here’s the original story, including the story as told by Kyle. Lost Ring Volleyball Court – Love You More.